The Festival Of Lights Parade is a super cheezy small town affair. But it’s fun to sit wrapped in a blanket on a lawn chair in the cold drinking spiked hot chocolate out of a thermos (bring your own supplies). 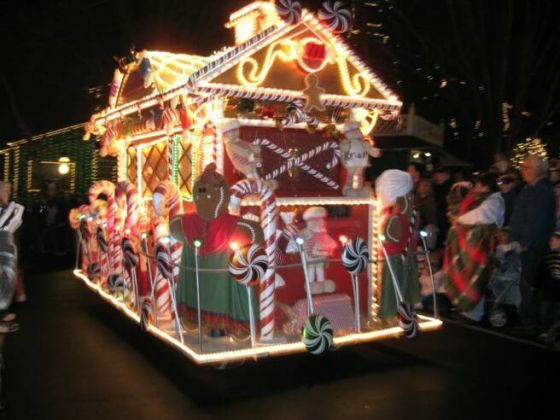 The parade starts at 5:50 on Saturday December 3rd at Tejon and St. Vrain. Before the parade there’s a kind of neat concert called Tuba Christmas which is a band made up of tuba players! They’ll be in Acacia Park at 4:00. In the afternoon on Saturday, you can go to The Pioneer’s Museum at 215 S. Tejon St. for Children’s Holiday Magic — There’s music and entertainment, including the Springs Singers, a magician, crafts, activities for kids and more, 10 a.m.-3:30 p.m.
And don’t forget, there’s free parking every Saturday and Sunday downtown at all the meters during the month of December. Shop local!